I have a great fondness for Chinese cuisine. And at the top of my list are both Sichuan and Cantonese. 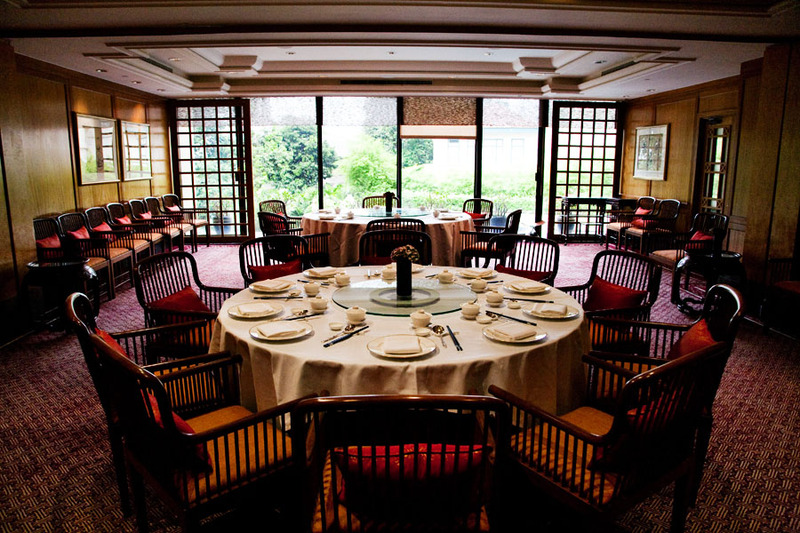 Living in Chinatown in Singapore one might expect the best Chinese dining to be here…and while this is not entirely incorrect, we were recently blown away by a lunch at Summer Palace in the Regent Hotel. They have recently reinvigorated the restaurant with the addition of a new chef and the makeover of the interior. Having never visited before, I cannot comment on the degree of change, but one thing I can say is that this is the best Cantonese I have had outside of Hong Kong. It was, in a word, outstanding! 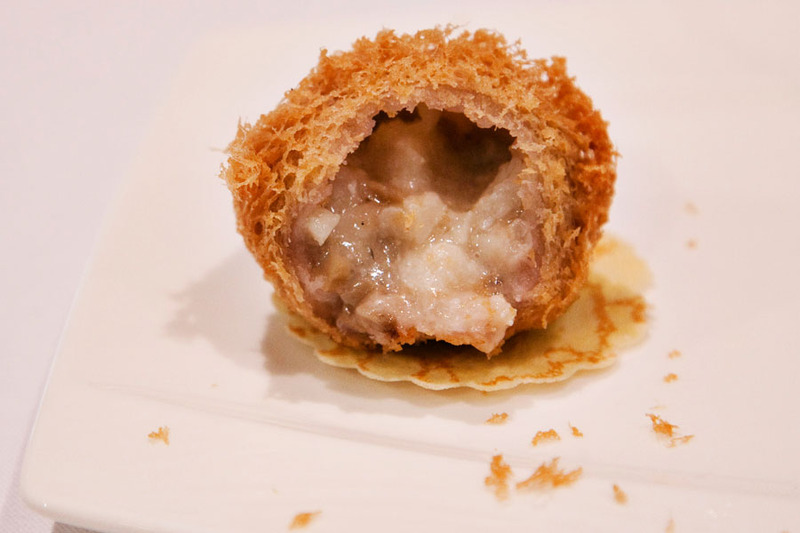 Being dim sum addicts, we were excited to see that the lunch started with a course of dim sum – a deep fried yam with garoupa, shrimp dumplings with bird’s nest, and barbecue pork buns. 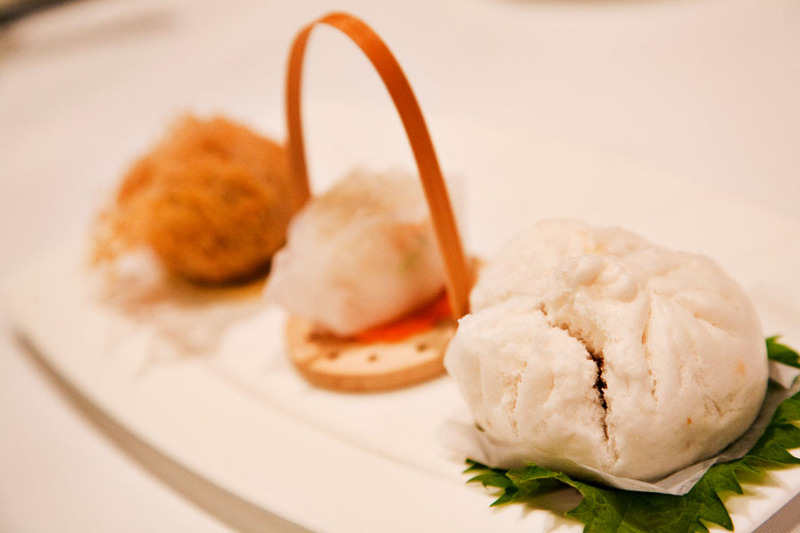 All were absolutely perfect in execution – the barbecue pork bun was super light and airy, while the shrimp dumpling with bird’s nest was bursting with fresh seafood flavour. But I think our favourite was the yam with garoupa. A crunchy yam outside concealed a creamy rich inside and the contrast between the two was heaven. Our next course was Scrambled Eggs with Caviar and Crab Meat – a fairly simple description for one of the most impressive dishes of the day. 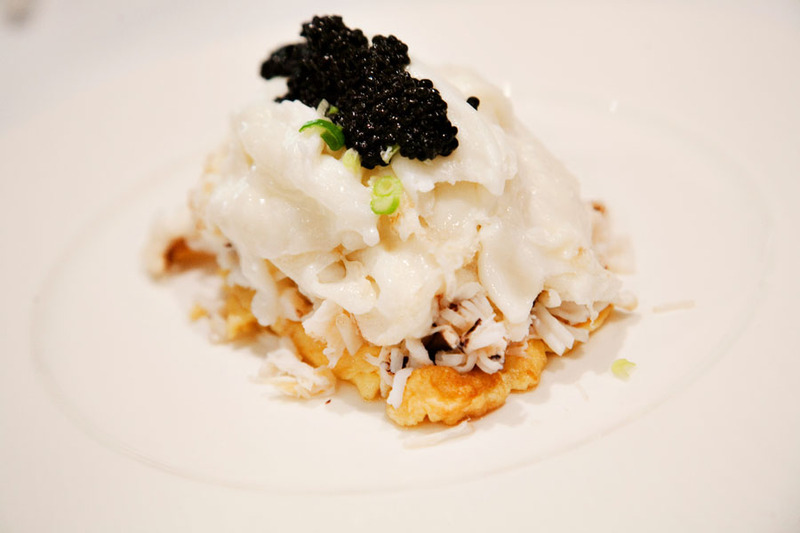 The chef layered scrambled eggs, crab meat, scrambled egg whites and topped the whole thing off with caviar…an unusual choice as caviar is not a typical Cantonese ingredient. We couldn’t get over how fresh and flavourful each element of the dish was – the crab was simply steamed but bursting with flavour and the layering of egg and egg white was brilliant not only from a taste standpoint, but also because of the textural variety it added. Paul called them the “fanciest eggs I will ever eat” …this may be true, but this was not just fancy for fancy sake, it was a truly amazing dish that was a mouthful of delicious richness bite after bite. Next was Wok Fried Crocodile with Spicy Sauce – a delicate balance of flavours and textures between the crispy celery and meat from the tail of the crocodile to the subtle yet spot-on seasoning of the dish. This again was one of our favourites. 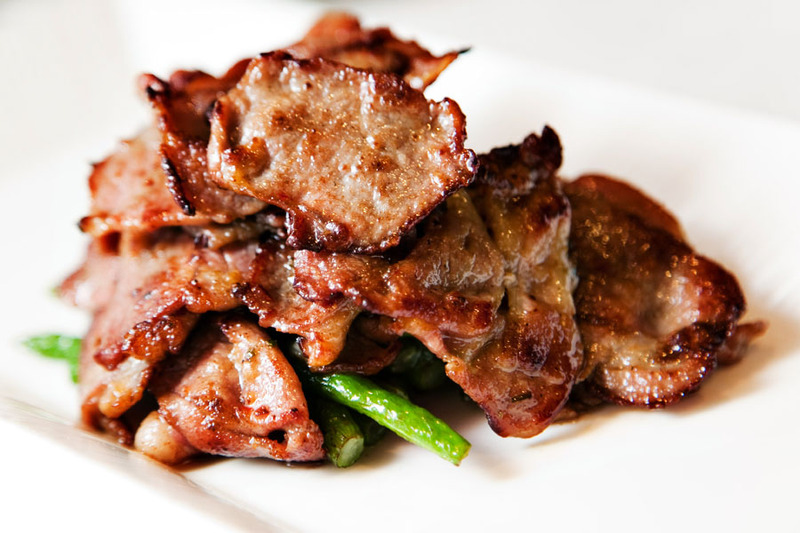 It was a perfect execution of Cantonese cuisine – despite wok frying, not greasy and well balanced with each ingredient able to stand on its own. The restaurant manager helped us out a bit by suggesting to try the XO sauce with it – and this really took it to the next level. And actually this was one of the things we really enjoyed about the service – we don’t always know which sauces go with which dishes, so we really appreciate it when someone like the manager at Summer Palace takes the time to help us enhance our experience in a way that doesn’t make us feel silly for not knowing how to combine things. 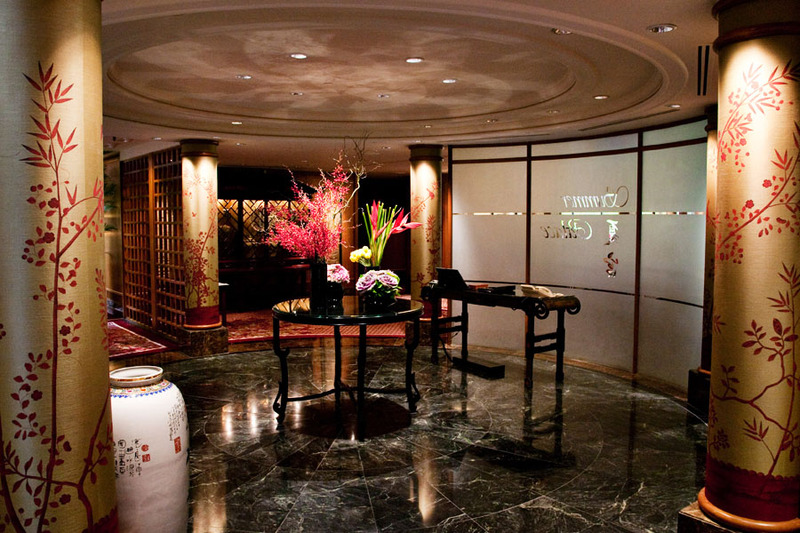 It’s this level of friendly and discreet service that can really set a dining experience apart from others. We moved on next to a dish of Pan Fried Lamb Loin with String Beans. Paul loved the way this was prepared – sliced thin and fried with a touch of sauce it had both a sweetness and a gamey-ness to it as well. This simple preparation really highlighted the base ingredients. Followed by Steamed Glutinous Rice with Crab served in a Bamboo Basket – as much as I love the other items, I wish this had come first so we would have had more room in our tummies. It was stunningly good. The crab claws had been cooked on the base of rice, so the whole basket was perfumed with the delicate scent of crab. And the rice had taken on an almost creamy quality that when combined with the crab was, for me, truly amazing. I am not usually a fan of the Chinese puddings and jellies, but I must admit these turned me and totally changed my opinion of Asian desserts. 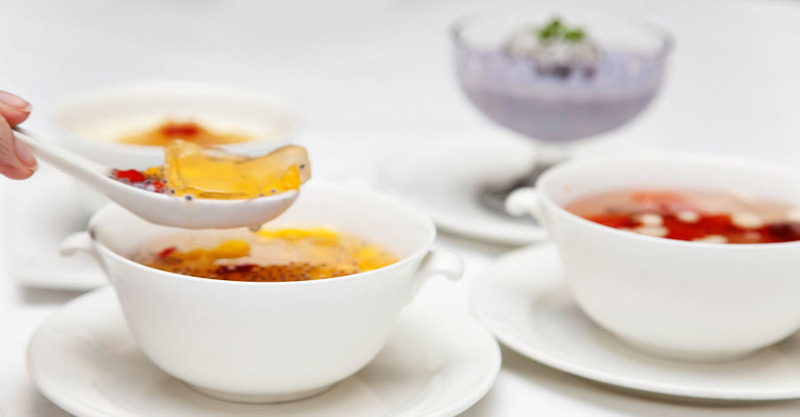 We enjoyed a group of desserts that were classic Cantonese – Chilled Yam Pudding, a Chilled Lemongrass Jelly and Aloe Vera in Lime Juice, Double Boiled Papaya with Snow Fungus and Almonds, and a Double Boiled Egg White Milk Custard with Bird’s Nest. While all were amazing, Paul and I agreed that the Yam Pudding and Egg Custard were our two favourites. 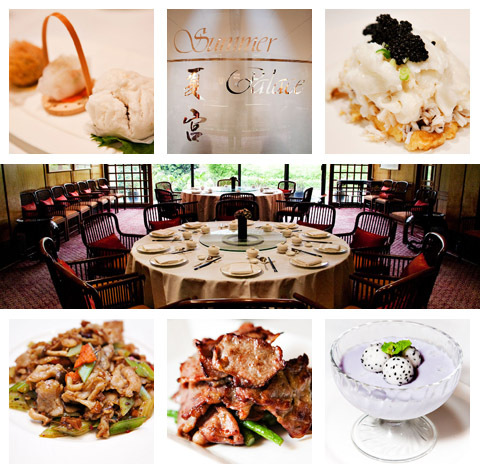 In our opinion, Summer Palace is presenting the best executed Cantonese in Singapore. And for me, several of the dishes like the Egg dish, the Crocodile dish and the Steamed Crab in the bamboo basket are destination dishes – meaning I would come back specifically for those dishes to enjoy them time and time again. 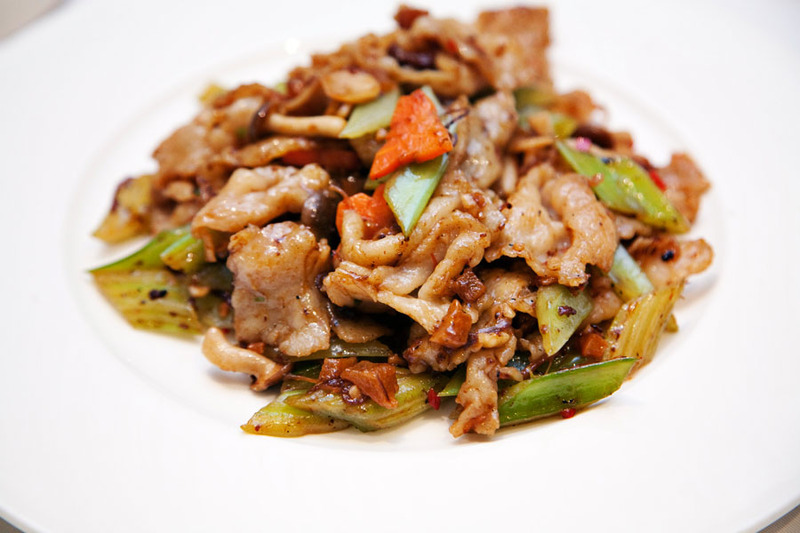 If you are looking for Cantonese food of the highest quality, then run, don’t walk, to Summer Palace. Does crocodile taste like alligator? We have a few places here that serve alligator, one is a pizza place.